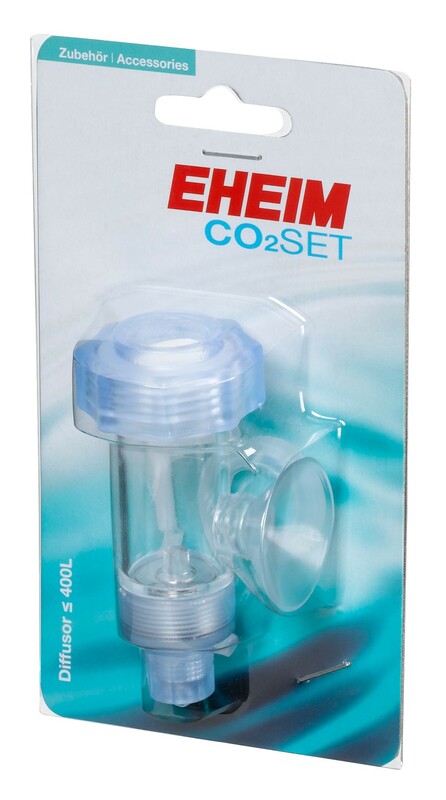 Eheim highly efficient ceramic diffuser with built in bubble counter and non return valve. You will earn up to 11 reward points after purchasing this product. Next working day delivery is available on all In Stock items if ordered before 2:00pm. Next working day delivery is only available to UK Mainland addresses (Not Including Scottish Highlands). Special Order & Direct Delivery items state an estimated delivery date next to each product, these are a guide only. Goods must be signed for upon delivery and any damages/shortages reported to us within 24hours. If goods are not received within 21 days, contact us direct and we will offer you alternative products to the same value or a full refund. Delivery is free for orders over £50 and is £4.95 for orders under £50 (up to 20kg maximum weight. Orders over 25kg weight will be subject to a surcharge). For low weight or low value orders we reserve the right to use Royal Mail First Class Recorded Mail instead of a courier. If this service is used, delivery should still be next day but is not guaranteed. Deliveries to some postcodes including Northern Scotland, Northern Ireland, Isle and Man and the Isle of White are subject to an additional delivery charge by our carriers which we have to pass on. If there are any additional surcharges to pay, we will contact you before shipping the order. For other destinations please contact our customer services department at contact@theaquariumlincoln.co.uk or tel. 01522 548319. The Aquarium Lincoln denies any liability for any consequential loss caused by damaged or faulty items, delay in dispatch or delays by carriers. In the unlikely event of a delivery not arriving on time, any extra delivery charge will be refunded. However we cannot accept any liability involving third party contractors and would advise that no arrangements be made for installation until you are in receipt of your order. The courier requires a signature on delivery. If there is any possibility the delivery address will be unattended once your order has been dispatched it is essential that you contact them to arrange an alternative delivery time. Couriers will leave a card after the first delivery attempt and your order will then be retained at one of their depots for you to contact them to rearrange delivery or for collection. Collection information will be on the card left by the courier. If the courier is unable to deliver after two attempts your order will be held at their local depot for your collection. If you do not collect your order or contact the local depot within the next 2 days the item will be returned to our warehouse. The courier will charge us to return the order to our warehouse and we have no choice but to pass on this charge. If you require your order to be dispatched again the full delivery cost of £4.95 will be payable. Return of goods after 30 days is at our own discretion. Products that carry a manufacturer's guarantee can be returned, if faulty to us for exchange/refund during the warranty period. All products still in guarantee will be tested upon return. If the seller accepts the return of goods/cancellation of order (other than on the grounds of defect) the seller reserves the right to make a handling, cancellation and restocking charge of 10%. Products that are especially made/ordered, perishables e.g. magazines, pond liners, plants, stainless steel products, videos, books etc. cannot be returned for refund unless faulty/damaged. Goods are not allowed to be tried/tested. Goods have to be returned to us at your expense. It is important that you obtain proof of posting as the goods are your responsibility until they are received by us. We can only refund postage costs if goods are returned within 7 days of purchase under the Replacement Policy. You should use the cheapest postage method available as we are not able to refund the cost of any special delivery service. We cannot refund postage for goods returned for any other reason and we reserve the right to deduct our original postage cost and a restocking fee from any refund applicable. Please be aware that aquarium pumps, filters, skimmers and other electrical goods emit noise during normal operation that you may consider to be excessive. You should be aware that manufacturers wording indicating noise levels are relative only and do not necessarily give indications of measured decibel levels. Return of good under these circumstances requires the agreement of the manufacturer and where goods returned are deemed to be in good working order by the manufacturer we are unable to offer a refund and may charge return postage. All electrical items serial numbers are recorded against each order so please ensure any item being returned is the original one purchased from The Aquarium Lincoln. If faulty goods are received you must notify us within 7 working days. Where possible replacement parts will be dispatched and where not possible we will ask you to return the goods to us in line with our Returns Policy. Once we have verified the damage we will supply replacements as required. Where good returned to us are in good working order we are not able to refund your return postage costs and we reserve the right to deduct our original postage cost and a restocking fee from any refund. If you have ordered stock items from our website, you have 7 days from when you receive the goods to return them to us for a refund. (This applies to website orders only and in store purchases are excluded). If you wish to cancel and return goods 'from stock' then you may do this within seven days of receiving the goods, as long as the goods have not been used. You will be responsible for returning goods to us, within 7 days, all goods must be in 'as new' condition and in the original unopened packaging. All transport and other costs involved in returning the goods will be borne by you as the customer; we do not operate a free returns policy. Once we are in receipt of the goods and we have inspected them, we will confirm your refund amount. You will then receive your refund within 30 days of cancellation and return of the goods.